John and Beverley moved from London to Old Town in Hastings, a move that was to greatly influence his writing. Hastings is a seaside resort and fishing town on the South coast of England “where you just can’t get away from the weather.” Island Records decided that John should revert to recording solo and Bless The Weather was completed in just three days. John Wood and John himself co-produced the album and it was released in November 1971. Music is a constantly evolving language, a shifting landscape of creativity where artists emerge, gain recognition and often subside into obscurity. Few artists successfully transverse this creative landscape and receive the recognition for innovation that they deserve. Remarkably talented, compassionate and often forthright, John Martyn is one such artist who has influenced and inspired whole generations of new musicians. Just when you feel that you’ve heard all he has to offer, when you’ve finally pinned down and categorised his music, he undergoes yet another metamorphosis. Folk? Blues? Reggae? Jazz? Rock? Trip Hop? Funk? John refuses to conform to any particular music genre whilst simultaneously embracing them all. His guitar playing has evolved over the years – acoustic guitar in the 60s, to electro-acoustic in the 70s with a wah wah pedal, fuzz box and echoplex, to the 80s which saw him playing electric guitar almost exclusively in a full band setting and the 90s which saw trip hop and funk enter his music. There was no Hogwarts for John his guitar wizardry is self-taught; a truly progressive artist who has never been one to stay with a tried and trusted sound, preferring to explore, experiment and break new ground bringing new ideas, colours and textures to his music. His live performances are legendary and many of the songs on John’s studio albums have evolved from exploring and pushing back accepted musical boundaries during these free and less structured live performances. John is an incurable romantic who sings from his heart; no other artist sings with such commitment and emotion. People fall in and out of love listening to his magical songs of deep sensitivity. John’s music is a barometer of our emotional state, our well being can be measured by the songs we listen to; passion and spirituality are at the heart of them all and in the heart of the man himself. John walked to school at the Shawlands Academy in Moss Side Road and later attended the Glasgow School of Art but was asked to leave after a couple of months! “I was thinking it was all going to be bohemian, listening to Rolling Stones records all day and smoke dope and drink coffee. That was going to be my life style and it didn’t work out that way.” His interest in music came from his parents but not just as a result of their profession, “my father was a bit of a raver… he had a Davey Graham record!” Davey Graham was to become one of the major influences on John’s music. I asked John about his childhood, “I was a cub scout!” He enthused. During the school holidays John stayed with his mother, “we had a houseboat on The Thames at Thames Ditton and then later opposite the Ship Hotel at Shepperton. The pub would be full of actors from the nearby film studios…a very strange bunch,” he added chuckling to himself. John saved up money from a paper round to buy his first guitar and learnt to play at fifteen years old. Aged seventeen, he left school and started to play in some of the local folk clubs under the wing of Hamish Imlach, who encouraged him to play and introduced him to many different music genres. Imlach, who could see the ability and promise in John, was born in Calcutta. He was a warm, generous man and a singer and blues guitarist with a considerable reputation. London Conversation (IMCD319) was released when John was just nineteen years old and a little over a year later his second album The Tumbler (IMCD320) followed. John and Beverley’s Stormbringer (IMCD317) and in particular the songs Would You Believe Me and The Ocean featured the introduction of John’s echoplex guitar technique which was to play a key role in his studio albums and concert performances in the 1970s. John was inspired by the saxophonist Pharoah Sanders and in particular his album Karma. “The only reason I bought the echoplex was to try and imitate Sanders’ sustain on my guitar.” The Road to Ruin (IMCD318), released in November 1970, was to be John and Beverley’s last album together. John had disagreements with producer Joe Boyd of Witchseason Productions over the album and, because of the numerous overdubs, felt that the recording lacked spontaneity. Bless The Weather, a beautiful and heartfelt album, was recorded at Sound Techniques in Chelsea. Danny Thompson played bass, Richard Thompson, Tony Reeves (Colosseum), Ian Whiteman and Roger Powell (Mighty Baby) all contributed. Danny Thompson had played at Ronnie Scott’s Jazz Club, with the leading jazzers of the day such as Tubby Hayes and Alexis and then became a founder member of Pentangle in 1967 establishing himself as one of the world’s foremost double bass players. He had pushed back the contemporary boundaries of folk music with Haitian Fight Song and innovative solos on other Pentangle songs at a time when it was unheard of for a Double Bass player to play a solo. Danny had played on The Road To Ruin and this was the beginning of a long friendship that saw Danny go on to play on Solid Air (IMCD274) and Inside Out (IMCD322) in 1973, Sunday’s Child (IMCD323) in 1975 and One World (Deluxe Version 981 922-2) in 1977 not forgetting of course Live At Leeds (One World Records OW107CD) in 1975 which encapsulates all the atmosphere, enthusiasm and improvisation of a John Martyn live performance. The calm and floating Go Easy, the organic and joyous celebration of spirituality Walk To The Water and anthemic Head and Heart instill a feeling of inner contentment, “Bless the Weather is the purest record I ever made.” For the first time we can also hear a version of Head and Heart recorded with a band during the sessions on 17th May 1971. You know we all get scared from time to time. Love me like a child. Away to where I know I can be clean. Love me when I’m wild. Scared of being wrong and that’s it all. In November 1971 John went into the studio to record a version of May You Never featuring drums and back-up guitar. John told me, “John ‘Rabbit’ Bundrick played keyboards and Kossie played guitar…” At the time John didn’t like the way the recording turned out and left the producer to overdub and piece it all together. May You Never was released as a single in 1971 (WIP6116) but it didn’t sell well and was subsequently re-recorded and appeared on the 1973 album Solid Air becoming one of John’s most popular songs. “It always goes down sickeningly well!” The single version is now available for the first time on this expanded and remastered release. John had met Paul Kossoff (Free) in Scandinavia when they were both touring, John admired his music and the two became good friends. The same session in which May You Never was recorded saw them jamming and feeding of each others creativity resulting in the incredible 18 minute long instrumental Time Spent Time Away recently unearthed and released on Free’s Boxed Set Songs of Yesterday (IBXCD3). A short version called Time Away appeared on Kossoff’s Back Street Crawler album (IMCD084) in 1973. In the years that followed John attempted to help Kossoff through the drug related health problems that were blighting his life and for a while Kossoff lived with John and Beverley at their home in Hastings. Sadly his battle against drug addiction was unsuccessful and he died on 19th March 1976 of heart failure aboard a flight to New York. The heartbreaking and painfully simple Bless The Weather features awesome vocals and playing by John, and Danny Thompson is at his note bending best. Curse the storm that takes you home. John’s rendition of Singin’ in the Rain by Nacio Herb Brown and Arthur Freed (made famous by Gene Kelly in the 1952 film) closes the album. 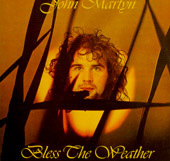 Bless The Weather proved very popular receiving enthusiastic reviews from his fans and the music press. John appeared on a Live In Concert show that was held at the special request of BBC Radio 1 on 30th December 1971. He performed Head and Heart, Singin’ in the Rain (with obligatory audience participation), Bless The Weather and a very early version of Outside In.